Welcome to the Day 2 of the Week of Continuous Intrusion Tools. I am doing a series of posts which explore the attack surface of CI Tools. Registration of new users is enabled by default. Registered user gets Project Developer privileges. Guest login could be enabled. In fact, so many public instances has it enabled. Also read TeamCity Security Notes. The information available with public instances of TeamCity is mind boggling! I saw web portal credentials, database credentials, hidden services and code repositories and much more on some public instances. We may not require compromising TeamCity to get access to intellectual property of an organization, much could be gathered from the instance. But to access the Operating System and do more fun stuff we must have a Project Administrator privilege (non-admin). This user role has the capability of Adding/Editing build steps. Fortunately, TeamCity has some protection against Brute Force attacks. It locks a user for one minute after five consecutive wrong login attempts within a minute. Also, it sends the password in encrypted form in transit. Still, since it does not enforce any password policy on user passwords, it is still possible with reasonable success to brute force it. To enumerate users, we can either go through [TeamCityUrl]/viewLog.html?buildId=1 and iterate through it to look for user who triggered the build or a better way is to use its API and iterate through [TeamCityUrl]/app/rest/builds/id:1 and look for "user" tag. There are generally enough manually triggered builds to enumerate a good number of users. 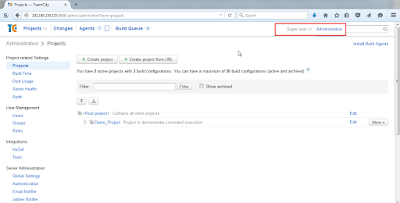 Keep in mind that TeamCity blocks a user for one minute after five consecutive login attempts, using delay is advised. We should keep trying unless access to a Project Administrator is achieved. Having the privileges to Configure builds we can do interesting stuff. Sweet! We have SYSTEM privileges. Now, lets use some PowerShell hackery to improve the result of the above. In a restricted environment, we may have only limited options for a connect back. Lets use Invoke-PoshRatHttps.ps1 from Nishang. Thanks to Casey, this shell makes a valid HTTPS connection between a target and a listener. Also, its client part is quite small and we just need to execute one line of PowerShell on the target. 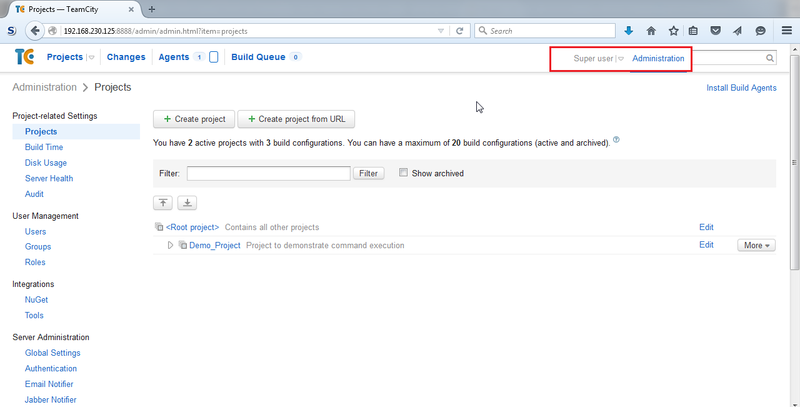 Now, if we have the capability of configuring builds on master, few more interesting things can be done. Great! Interestingly, a Super User token is regenerated only when the TeamCity Server service is restarted. Also, there can be any number of Super User logins simultaneously. It means once you get access to a Super User token, it could provide a reasonable long access to the TeamCity instance. Fun Fact: We can lock out Super User for one minute by attempting to login with a blank username and password on TeamCity login page. Though I have not tried it, a Super User may be locked for longer duration by scripting the login attempts. TeamCity allows users to upload SSH keys for projects. These keys, which are the private ones, are stored in clear on the master! Read the documentation here.Whats worse is we can read the keys if we have the ability to configure builds on the master. The keys are stored in the [TeamCity Data Directory]\config\projects\[project]\pluginData\ssh_keys directory. We can get the Data Directory from the teamcity-server.log file. 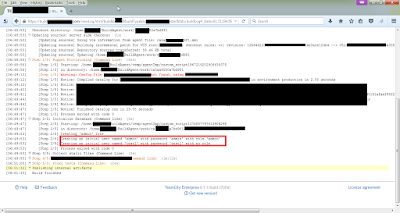 Instances with Guest login enabled: intitle:"Projects - TeamCity"
Instances which allow Registration of new account: "intitle:Register a new account – TeamCity"
TeamCity instances have very sensitive information. The below screenshots are just examples, there is a gold mine out there. In the below screenshot, the build log contained url of a product under development along with the credentials to access it with admin privileges. The one below had credentials for the database administrator sa account password. 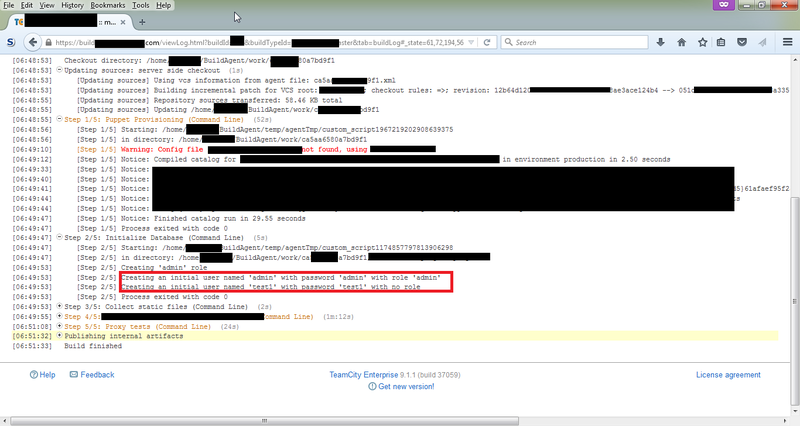 The public IP address of the database was visible in another build log. As far as I know, TeamCity does not use the affected library.